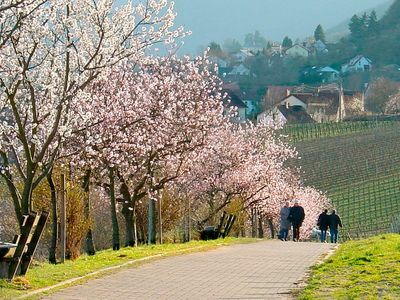 Spring is almond blossom time in the Rheinland-Pfalz or Rhineland-Palatinate and although the Pfalz has a many highlight events happening throughout the year, none is more highly anticipated than the Almond Blossom Festival. The appearance of the first almond blossoms is an indication that winter has come to an end and the Almond Blossom Festival celebrates the arrival of spring. The Rhineland-Pfalz is Germany’s leading wine producing region and wine festivals and events abound in the area. The town of Gimmeldinger gets very busy as Gimmeldinger Mandelblütenfest (Gimmeldingen Almond Blossom Festival) is also the first wine festival in the year and obviously a very popular festival. Vintners offer their new season’s vintages, delicious regional foods are served and the celebrations culminate with the crowning of the Gimmeldinger Almond Blossom Queen. All the celebrations are a welcome change from the drab gray of winter. Usually the entire Rheinland-Pfalz region is covered in a canopy of magnificent pink by March, but the actual timing does depend on the weather and the blooming of the almond blossoms. Throughout the entire month of the almond blossom season, the pretty wine-growing villages along the German Wine Route celebrate nature’s magnificent show by lighting up the castles, palaces and churches in the region with pink illuminations as darkness falls. Visitors doing the German Wine Route during this season will see pink in the Palatinate. Some things to do during the Almond Blossom season include Gourmet Safaris, Almond Blossom Walks, Picnics in the almond groves and visits to wineries. A vintage double-decker bus takes visitors on a 2.5 hour tour of the German Wine Road and the cost includes a welcome drink and a wine-tasting feast. There are evening tours as well which allows visitors to see the castles and palaces illuminations. To take something back with you from this almond growing region one can purchase Pfalz wines, almond liqueur, almond oil, or small gifts such as fragrant almond soap, chocolate almonds, almond blossom jelly, almond blossom pastries, etc.